Losure, Mary. 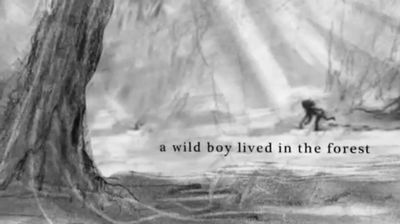 Wild Boy: The Real LIfe of the Savage of Aveyron. Illus. Timothy Basil Ering. Somerville, MA: Candlewick, 2013. Print. Summary: In the late 1700s, French villagers discover a wild boy in the woods. Maybe only nine years old, the child is naked as a jaybird and grubbing for food. He has scars from old burns smattering his skin and one long scar slicing across his throat. Miraculously, he is alive and self-sufficient. The boy is captured, studied, and the entire trajectory of his life changes forever. So too are some of the lives that come in contact with him. Critique: Losure’s style is concise. Rather than feeling like skin and bones prose, hers feels more deft. She does a lot with very little — like the best bikini designers. She leaves many questions unanswered, and not just because sources are sparse or do not provide answers. Rather, Losure gives readers a lot of subtext to chew on. Without directly stating it, she presents the possibility that trying to civilize the wild boy may have done more harm than good. The story quietly confronts the supposed supremacy of civilization. The text confronts the efficacy of certain teaching methods that run like a one-way street. It ponders whether dialogues between teachers and students might work better. The pencil/charcoal sketches are full of free, thin lines contained by lots of hard scribbling, jagged outlines. The result is an emotional mirror of the content: a small, free spirit trapped by a rigid society. My favorite (the most memorable) drawing is on page 123. The Wild Boy, named Victor, peers curiously into the benevolent face of his life-long teacher and guardian, Dr. Jean-Marc-Gaspard Itard. Losure’s writing fuses with Basil Ering’s illustrations forming a wonderful bridge text for readers working their way out of chap books and into the realm of nonfiction (which, with Common Core, is just about every kid in school right now). This entry was posted in Annotations and tagged annotating is a good habit, CCSS, Common Core, good reads, Mary Losure, middle grade books, nonficiton, reading, the savage of Aveyron, Wild Boy by jenmichellemason. Bookmark the permalink.